QAthlete is an easy-to-use online application for professional heart beat analysis to support diverse aspects of well-being. The solution is developed for the needs of work-related research, occupational and preventive healthcare and applied physiological research. QAthlete is designed for applied research and field measurements in which accurate information on physiology is needed but intrusive methods are not feasible. The analysis and reports created by the application need only one physiological signal - beat-by-beat heart rate data (R-R interval). The measurement can be carried out during normal daily routines (e.g. during normal workday, leisure time, walking, and sleeping). Although the data collection procedure is simple, the method can produce meaningful information. Whether you're an experienced athlete looking for a way to optimize your training program, or simply a beginner hoping to improve your shape, QAthlete is there for you. - Find your optimal physical workload before going to the gym. - Avoid overtaxing your heart as well as other parts of your body. QAthlete will also allow you to track your progress with real time data that will show you how much strength (fitness) you are able to gain each exercise, for days, weeks, months, etc. Compare your fitness level with other athletes around the world, and see where you stand on the worldwide scale. Do a training session with QAthlete's Belt and determine what workload is best for you at any given day or time. In some cases QAthlete may advise you to stay home and rest or take a walk instead of doing your full workout. For example, if you run a Fitness Test session and your fitness level turns out very low, QAthlete may advise you not to proceed with your training exercise. Overtraining can lead to far-reaching stress consequences for your organism. Please, keep in mind that a low fitness level is not just indicator of undertraining or overtraining, it is also influenced by levels of exhaustion and fatigue of your body. You do your regular exercises, attend fitness classes, and manage your personal training program. However, are you aware of the progress you're making? What if your fitness program makes no difference to your actual fitness level? How often do your exercise? How do you know that the amount of time you spend on exercise is right for you? QAthlete's Fitness Test was designed for both well-trained athletes and beginners, to help them track their fitness progress over time. Take Fitness Test regularly and under similar conditions, e.g. every morning after you get out of the shower. This will better help determine the fitness progress you're making. You'll see the precise shift in your fitness level on a daily, weekly and monthly basis. Fitness Test is recommended for personal and gym use. 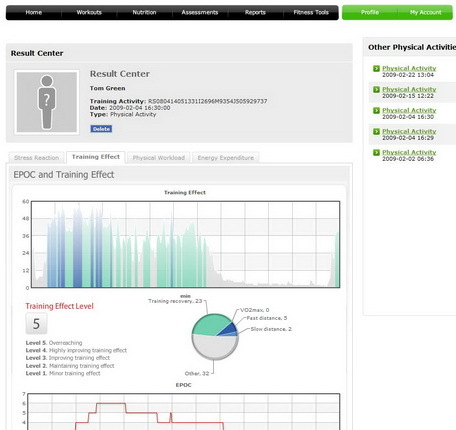 Use QAthlete Fitness Test software to track effectiveness of your fitness programs in your local gym. Measuring your fitness level before and after exercise directly provides information about your progress. Share your Fitness Test results with your personal trainer so that he/she can review your fitness reports from the training sessions you did at home, and provide you with the tips you need to improve. In order for your personal trainer to have access to your data he/she needs to be part of QAthlete's fitness program and you must have a personal QAthlete system set up at home. To join QAthlete's fitness program contact your local fitness club representative or personal trainer. Note: not all fitness clubs currently support QAthlete's fitness program!